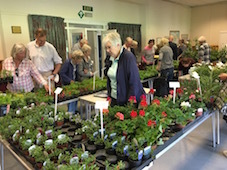 A plant sale is really easy to organise and a great excuse for keen gardeners to get together and raise money for charity. You need to plan and advertise your event well in advance. This will allow everyone time to sow extra seeds, take cuttings, pot stuff on and anything else necessary to have some spare plants for the sale. Timing depends on many factors - not least where you live in the world. Late spring / early summer is generally best. Your sale can take place in a hall or social club. They are always much nicer, however, out of doors. Perhaps you can use a school playing field or village green. Another idea is to use someone's garden or allotment. Sometimes it is possible to combine allowing visitors to look around a particularly fabulous garden (for a small charge) with your sale. Would you be better off with a stall at someone else's event? If you can't arrange an entire sale why not piggyback on something else such as a village fete. 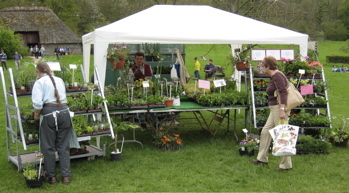 Another option might be collecting plant donations for a stall at a market or car boot sale. This can be organized in various ways. You may wish to simply have everything laid out together. Or you might allow everyone to be responsible for selling what they have brought along on their own little stall. Although we want to raise as much money as much as possible be realistic about your pricing - keep it fun and friendly. Picking up a bargain tray of bedding plants grown by that green-fingered lady at the end of your road is what its all about. You may want to buy in bedding plants at wholesale prices to sell on. This is a good way of making sure you have enough stock to sell and to encourage people to come to your sale. But home produced plants dont cost you a penny and can turn a nice profit. Maybe a plant swap fundraiser is a better idea? If you do things this way you simply charge an entrance fee and then allow people to make their own deals. Similarly seed swaps are popular. Is there a local expert you could invite along. 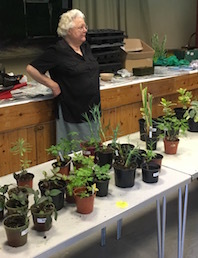 A 15 minute talk or demo on a garden topic can only add to the day. Local garden maintenance companies or garden designers may be willing to come along in exchange for the opportunity to promote their services. Another good source for a local garden expert is your local radio station many of whom have a garden show. Could you get them to come along? Gardeners are a friendly lot and your sale should be a real opportunity to socialise. Offering home-made refreshments helps add to the fun and boosts the coffers further. A cream tea in a beautiful garden chatting to your friends - what could be better? 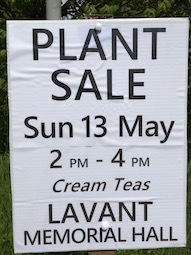 All in all a plant sale is a great way to fundraise. It brings in the cash but also can be one of those lovely community events which sends everyone home happy.